Atmosphere, character and all the mod cons. 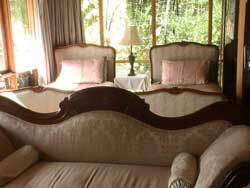 A cozy room with an antique bed with canopy, antique furniture and ensuite. 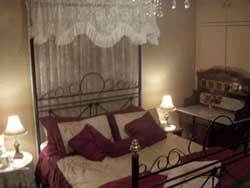 The adjoining room has its own wood fire, TV/DVD, fridge; can cater for extra 2 with single french satin beds. A little retreat that comes with a queen-size canopy bed, antique washstand and chase lounge, ensuite, fridge and french doors overlooking the front terrace. A spacious suite with high ceilings that has a queen-size four poster bed, ensuite, a roomy sitting area with antique furniture. 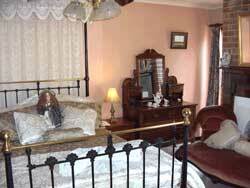 The upstairs room has an antique brass bed as well as a queen bed, chase lounge and antique furniture, bath room downstairs with bath and shower. 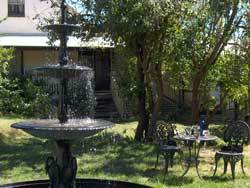 Click on enquiries below and let us take care of your stay in Braidwood.